The story is staged in the distant future within our own Milky Way Galaxy, approximately in the 35th century. Unlike many science fiction stories, there are no alien civilizations. A portion of the galaxy is filled with terraformed worlds inhabited by interstellar traveling human beings. For 150 years two mighty space powers have intermittently warred with each other: the Galactic Empire and the Free Planets Alliance. 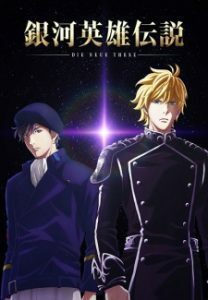 Within the Galactic Empire, based on 19th century Prussia, an ambitious military genius, Reinhard von Müsel, is rising to power. He is driven by the desire to free his sister Annerose, who was taken by the Kaiser as a concubine. Later, he wants not only to end the corrupt Goldenbaum dynasty but also to defeat the Free Planets Alliance and to unify the whole galaxy under his rule. There is a third neutral power nominally attached to the Galactic Empire called the Phezzan Dominion, a planet-state (city-state on a galactic scale) which trades with both warring powers. There is also a Terraism cult, which claims that humans should go back to Earth, gaining popularity throughout the galaxy. 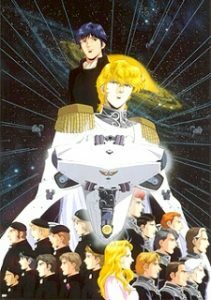 As a huge Star Wars fan I’m always up for a good space opera but I’d never seen one so sprawling and politically focused as LoGH. 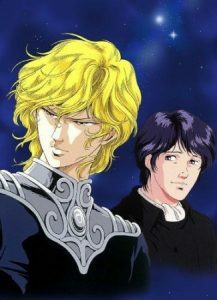 Yang Wenli is the perfect mix of relatable laziness with brilliance in both history and tactics. 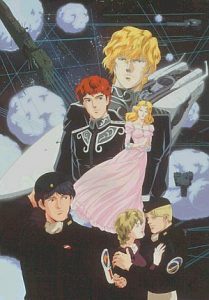 Yet Reinhard is also likeable and as a viewer one tends to pick their favorite characters on both sides. 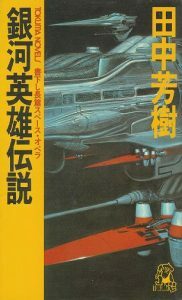 The huge space battles and maneuvers are entertaining as hell but the real hook for me was the examination of a just dictatorship fighting against a corrupt democracy. And despite every opportunity he’s given, every stupid command by his superiors, Yang refuses to reject his belief in the democratic system. It’s a show that’s mature, entertaining, and thought provoking all the way through. 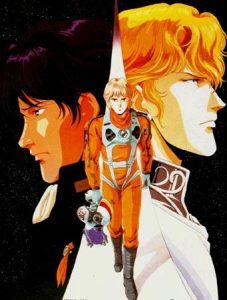 In the summer of 2006, Mutta Nanba and his younger brother, Hibito, witness what they believe to be a UFO, which flies off towards the moon. Hibito decides he will go onto the moon whilst Mutta decides he will aim for Mars. 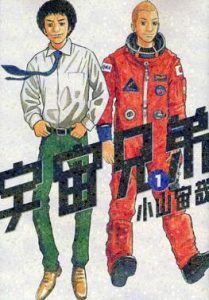 Nineteen years later, in the year 2025, and Hibito has become a fully fledged JAXA astronaut assigned to go on a mission towards the moon. Mutta, on the other hand, has not been so successful in achieving his dreams. 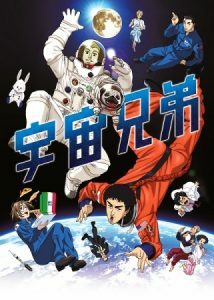 As Mutta eventually recalls his past ambitions, he receives a letter stating he has been accepted to join a JAXA training program for new astronauts. 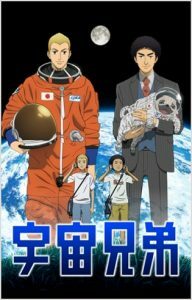 The series follows Mutta as he seeks to become an astronaut and achieve his longtime dream just like his brother did. I’ve always loved NASA and space travel so this show was right down my alley from the beginning. But what really elevates it is the huge cast of likeable adult characters and the slow but steady progression of the brothers’ dreams. It doesn’t shy away from how difficult it is to become an astronaut and watching Mutta persevere through it all is immensely inspirational. 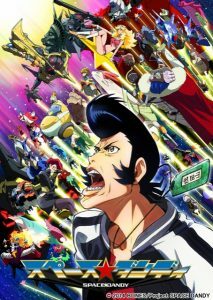 The story revolves around Dandy, a human alien-hunter. His job is to seek out new aliens never seen before, and receives a reward whenever he finds a new species. Dandy's mission is to find those new species faster than anyone else as he travels the galaxy and he travels with the bucket-of-bolts robot QT and the dimwit alien Myau he picked up. 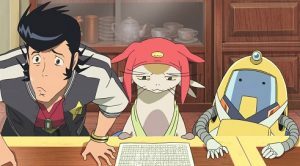 Along the way , Dandy comes into contact with new planets and their inhabitants. 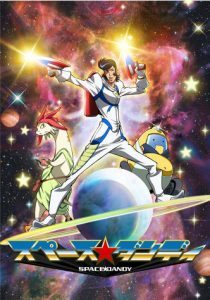 Space Dandy is not Shinichiro Watanabe’s best work but I would argue it’s his most creative. With so many amazing creators play around in the show’s crazy world Watanabe is able to give us a series bursting at the seams with contrasting tones, wildly varied animation, and fun characters. Not every episode is a winner but the duds are few and far between. Plus the sakuga nerd in me is in love with all the established master animators as well as rising newcomers that got to express themselves.